Gordon Strachan should be concentrating on reaching a major finals rather than changes at the grassroots, according to former Scotland boss Craig Brown. And Brown thinks the government should be investing more money in facilities to improve the standard of football. Present Scotland manager Strachan is poised to reveal a new blueprint for the future of youth development. "Gordon's job really, and this is not criticism of Gordon, is to get Scotland to qualify," said Brown. "It is great to hear Gordon because he's got such a reputation and he's so highly regarded, but I think his priority should be 'let's qualify'. "If that were to happen, you could cut the cost of the development programme because they would all want to be involved in courses and play football. "I know in my own experience that, when we were managing to qualify, the interest in the game increased." Brown said he had learned from former British Lions and England rugby coach Geoff Cook that "the national team is a far great incentive for the progress of the sport than any courses you can run or any money you can pour into it". 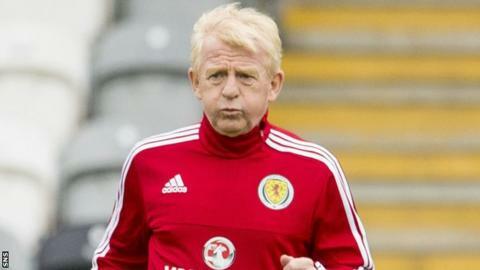 Strachan's much-publicised blueprint follows the failure of Scotland to reach the Euro 2016 finals. Brown, who led Scotland to the Euro 1996 and 1998 World Cup finals, thinks that development of the grassroots game should be left to new performance director Brian McClair and development officers Jim Fleeting and Donald Park. Brown recalled that one of his own attempts to reform Scottish youth football with an idea developed in France had been blocked by Celtic and Rangers. He had witnessed the progress made in France after then technical director Gerard Houllier introduced a rule that no club in the top flight could sign more than 20 players over the age of 20. Injuries to senior players forced Monaco to introduce 16-year-olds Thierry Henry and David Trezeguet into their first team - and two years later they were in the France team that won the 1998 World Cup after their national team had failed to qualify for the previous two major finals. Brown said that Rangers' representative Bert van Lingen and Celtic's Eric Black had told other clubs they should vote against Brown's proposal because it would put them at a disadvantage in European competition. The former Scotland boss said that the compromise of having a minimum of three under-21 players in the match-day squads had been abused by the clubs. Whatever changes are proposed to the youth system, Brown believes that more state aid, especially from the National Lottery, should be invested in football. "The Eastern European countries invest in far better facilities than we've got," he said. "The most successful European country in football is Croatia. Croatia qualified for the Under-16 World Cup, the Under-20 World Cup and the full World Cup - the only country in the world that did that. "But, when you go to Croatia, you see the facilities they've got their, you say 'wow'. "When the lottery was instigated here, we were told this would transform the game, but I'm told that three times as much money goes to the arts as to sport from the lottery. "We don't prioritise sport in the UK."